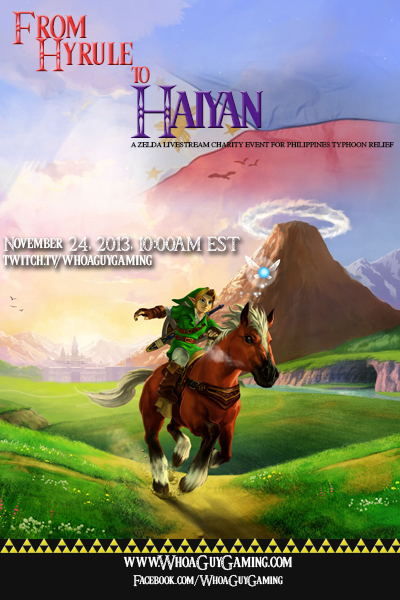 “From Hyrule to Haiyan” – Whoa Guy Gaming Charity Event for the Philippines! My friends and I at Whoa Guy Gaming, a charity gaming group, are stepping up to help the people of the Philippines affected by Typhoon Haiyan! After the success of our charity events for Hurricane Sandy and the Oklahoma tornadoes, we knew the moment that Haiyan made landfall that we needed to gear up to do what we could. We can’t do it alone, however; we need you guys! If you’ve never participated in a gaming charity event before, it’s simple: we play video games and entertain you, and you watch, donate, and help spread the word! This event’s game series is The Legend of Zelda! We hope that you will join us on Sunday, November 24th, 2013, and donate so we can get relief to the people that need it the most! We have planned for the original “The Legend of Zelda”, followed by “The Adventure of Link”, “A Link to the Past”, and “Link’s Awakening DX”. More games may be put on the list if time (and player energy) permits. Starting at 10am Eastern time on Sunday, November 24, 2013, we will be streaming our play on Twitch at http://www.twitch.tv/whoaguygaming . We encourage you to watch, as that is the primary attraction for our fundraiser- funny people playing great games for a good cause. During the broadcast, we encourage you to make a donation and then challenge us to do something in or out of the game! To donate with PayPal, visit http://gogetfunding.com/project/from-hyrule-to-haiyan-a-zelda-charity-fundraiser , click the green “Donate” button and follow the instructions there. Please also visit our Facebook page at Facebook.com/WhoaGuyGaming and join our public Facebook event. 100% of all donations will be forwarded to the International Red Cross and will go directly to aid victims of Typhoon Haiyan in the Philippines. Remember, even the smallest donations help! If you can’t donate, then please spread the word by sharing this blog post, sharing any of the links above, or visiting our Official Website to get more information and to stay updated on any future charity events. Any little thing that you can do can help us do our part to bring relief efforts to the people of the Philippines during this tragic time. We CAN make a difference, so let’s get together and do what we can! Also, feel free to drop me an e-mail or reply to this post any questions you may have. Game on!